Everton captain Phil Neville has announced that he will end his eight-year sojourn with the Merseyside club this summer after confirming he will not sign a new contract. Phil's current deal expires in June but no talks have taken place about extending his terms and, having spoken with manager David Moyes, he has reached a mutual decision to move on. Neville, who has made 295 appearances for Everton since he joined from Manchester United in August 2005, has made no secret that he wants to continue playing before embarking on a career in coaching or management. However, he will not consider his next move until the end of the current campaign as he wants to try and help Everton qualify for Europe. 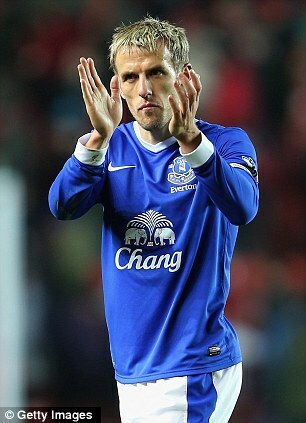 Neville said: 'It's been an honour to play for and captain Everton Football Club. I've thoroughly enjoyed my time on Merseyside and will leave with immense pride. 'I would like to thank the manager, chairman, all of the staff and the players at Everton for their continued support during my time at the club. 'I'd also like to pay a special thanks to the fans, who have been amazing over the past eight years and Everton will always have a place in my heart. Moyes believes the £3.5million he spent to bring Neville from Old Trafford is one of the best pieces of business he has completed during his time at Goodison and the former England international has been one of his manager's most trusted lieutenants. He has not been able to exert the same kind of influence this season and has not played in the Barclays Premier League since February 10 in a 2-0 defeat against Manchester United. 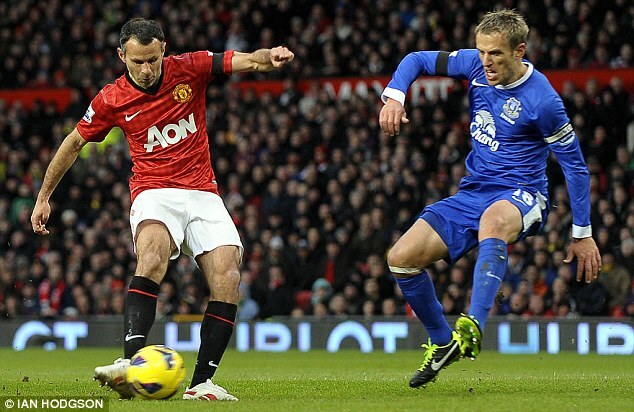 Neville's most recent appearance came against Wigan in the FA Cup on March 9 but though he has not figured as much as in previous years, Moyes has never made any secret of his admiration for the 36-year-old. Earlier this season, Neville ,who won six titles and a Champions League with United, became only the seventh man to reach 500 Barclays Premier League appearances. He will be part of England's Under-21s coaching staff this summer at the European Championships in Israel.